A line of about 20 students and staff members stretched down the hallway of the Student Activities Center Friday, waiting for the chance to get their hands on fresh beets, lettuce, onions, dill and other spices — all for free. 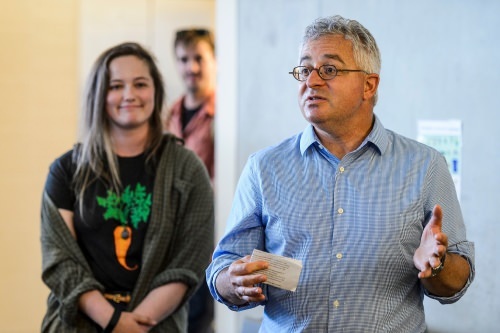 Friday, June 16, was the grand opening of the UW Campus Food Shed, a unique project started by UW–Madison senior Hannah DePorter who is majoring in conservation biology and environmental studies. 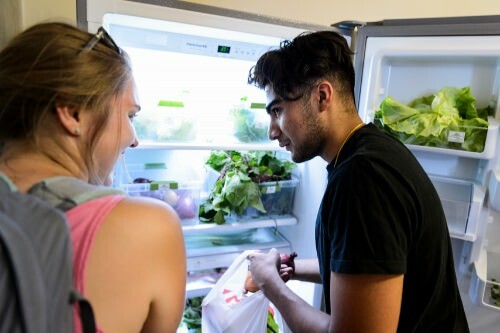 The program will give students and faculty access to free vegetables and produce, stocked by UW agriculture researchers and local farms with excess crops. Many of these excess crops would otherwise be composted or thrown out. 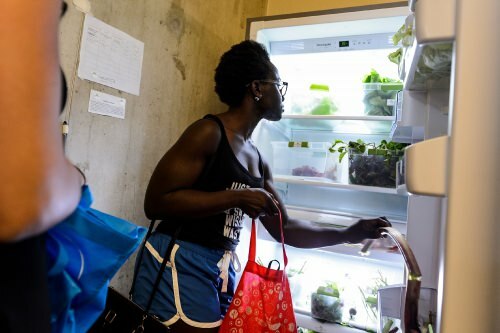 More than 40 people attended the opening, which was held at one of the four locations for food shed refrigerators on campus, the Student Activities Center. The other three refrigerators are located at Science Hall, the Allen Centennial Garden and the Horticulture Building. 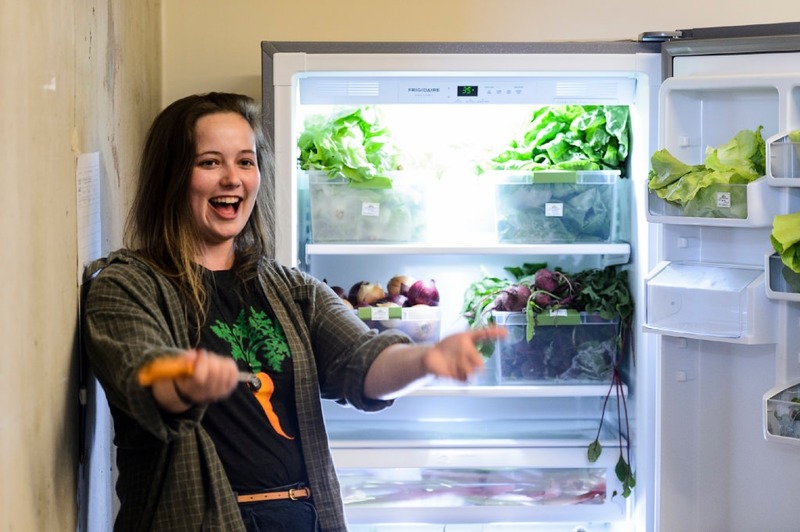 Not only will these fridges filled with free produce make adding healthy foods to one’s diet easy and affordable, DePorter said, it will also make UW’s agriculture research more sustainable by eliminating food waste. DePorter had the idea for the project when she was working for UW Horticulture Professor Irwin Goldman’s plant-breeding lab. As a part of the lab’s research, DePorter would travel to different agriculture research stations run by the university, which is when she noticed something. Some of the produce was already being given to food banks, but there was even too much for that, DePorter said. DePorter came to Goldman and explained this problem and her idea to make this produce available to the campus community. With the help of Goldman, DePorter applied for a Kemper K. Knapp Bequest grant, and received $5,000 this past January to start the project. Nine months ago, DePorter said she was not expecting her idea to come to fruition. Now she is happy to be able to make a difference, especially for students who struggle with food insecurity. “Me personally I don’t have any issues with food security, so I found it important to use my time and my privilege to do a project like this to make that access greater,” DePorter said. To help students become more food secure, Goldman said it’s important for healthy food to be systematically available, which is part of what the project aims to accomplish. UW sophomore Diego Villegas said he’s excited there’s going to be increased access to vegetables and fruits, especially since produce is so expensive in stores. He said the high prices of produce make it hard for students to eat healthy, even for students who are food secure. It’s also nice that there are four different locations, Villegas added. Jordan Salinsky, a UW senior who works for F.H. King Students for Sustainable Agriculture, said she’s happy the project is going to reduce food waste and make agricultural research more sustainable. Another beneficial aspect of the project, DePorter said, is it will help the campus community learn about Wisconsin farming. At the food sheds, DePorter said students can expect to see crops that are commonly grown in Wisconsin such as beets, carrots, onions, squash, potatoes, lettuce, spinach, kale, tomatoes, oregano, basil, dill and cranberries. DePorter said she expects there to be produce available from May to November. Goldman said none of these would be available if it weren’t for the hard work of DePorter. Goldman said he had been working in the same lab for 25 years, but it took a student to look at things differently and inspire change.